Feeling a bit like two stuffed geese after our over-indulgence at Ed & Carol’s, we waddled onto the plane at Denver, bound for Baltimore. We’d found the cheapest airfares with Frontier Airlines, whose logo is “A whole different animal”. Yep, must be a wolf in sheep’s clothing because we certainly got fleeced with the baggage charges – no such thing as free baggage allowance here, not even for carry-on bags! $250 later our 7 bags got checked in, there goes our savings on the flight! Because the boat was still on the hardstand, we’d organized a small studio apartment in Baltimore through Airbnb, which is a bit like a homestay deal, for the first few days. Colin, our host, usually lives there but moves out to his girlfriend’s place when he has visitors, so we had the place to ourselves. It did feel a little strange living in someone’s apartment (particularly as we never got to meet him! ), but it was clean and tidy and he’d thoughtfully left us breakfast supplies and toiletries which was a nice touch. Of course, our first mission was to find the boatyard and have a look at our new home. The yard was about 1.5 km away and it was getting late, but we walked there anyway, hoping we could get access. Not to be. The gates were locked and all we could see was the top of the mast behind a whole row of boats. Bruce was sorely disappointed, so the only way to console him was to buy him a beer (or two) and a plate of crab cakes, courtesy of Bo Brooks on the waterfront. They seemed to do the trick. Baltimore and Annapolis are renowned for the local delicacy of crabs so I’m sure there’ll be plenty more crabfests to come. Finally Sunday morning we got our first look at our new home! She was looking a little sad and sorry for herself after having spent nearly a year out of the water, and enduring a very hard winter, but nothing a little elbow grease wouldn’t fix. Thankfully we’d organized to have the antifouling done before we arrived (for landlubbers that’s the black paint on the bottom that’s supposed to slow down the algae growth), and a new folding prop for the starboard engine. The prop still hadn’t been fitted, but “Slim” (obviously a name given in jest) assured us it would be fitted by Wednesday, when we aimed to splash the boat. The next couple of days were a blur of endless trips to West Marine (the American equivalent to Whitworths) and Target as we stocked up on bedding, cleaning supplies, a new starter battery for the engines, crawled our way through the boat finding where all the through-hulls and pumps were, polished the topsides, took off the old name and replaced it with our new Toucan decals (carefully carried all the way from Australia – thank you David and Leesa from Boat Stripes!). And all in a sweltering 34 -35 degrees, with humidity around the 80% mark. Phew! We’re hoping the combination of walking everywhere and sweating profusely will shift some of that extra weight we gained! 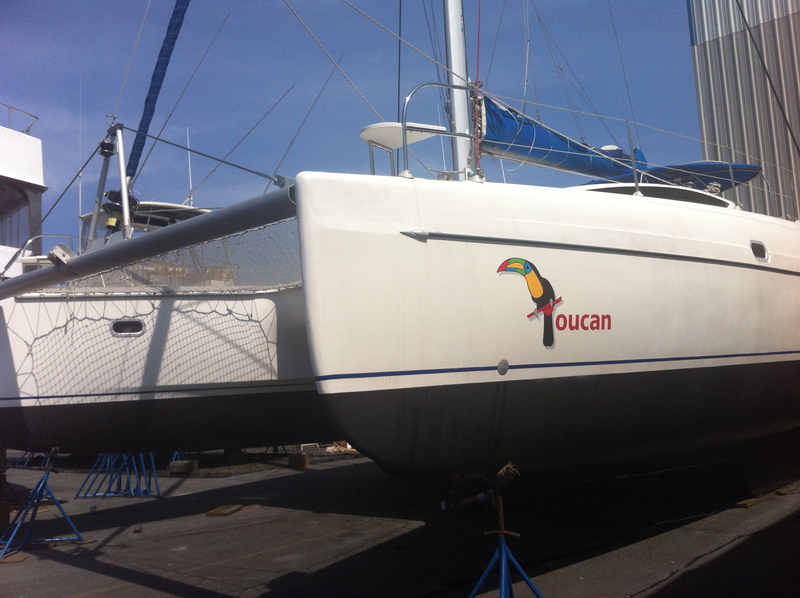 So tomorrow is the big day when all being well, Toucan will splashdown into her watery home once more, and we’ll be able to move on board and away from the noise of the boatyard. Fingers crossed!